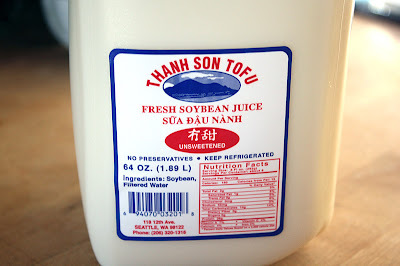 Recently, I was reading a blog post about buying fresh tofu and rice noodles in Seattle, and was seized with the obsessional need to find the tofu shop mentioned in the post (Than Son Tofu), and go buy some of my own. 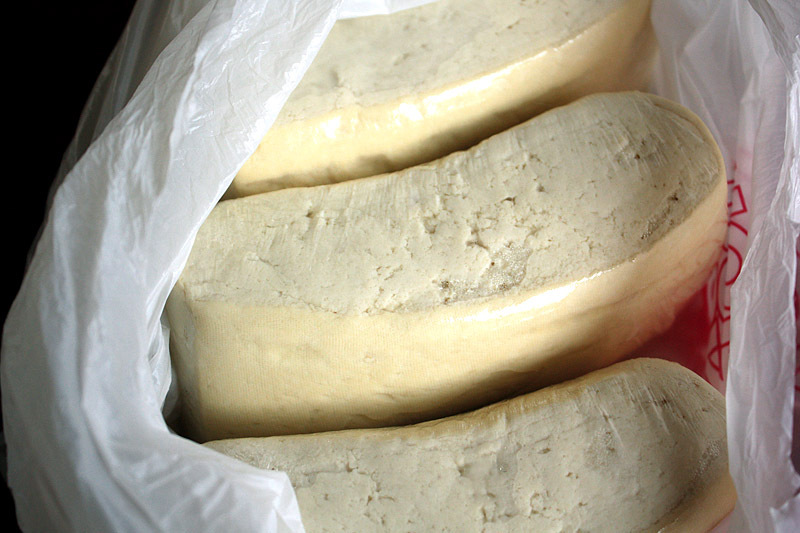 I started thinking about long ago in upstate NY, when we lived a block away from a tiny little shop where a Chinese man made fresh tofu every day. When he told me he ate eight small cakes of tofu each day, it almost killed my desire to eat any, but his tofu was so good, it was hard to resist. And I remember when we lived in Madison, Wis., buying fresh tofu from a tofu co-op called The Bountiful Bean. But we haven't bought any fresh tofu since coming to Seattle, just the stuff in the sealed packages. 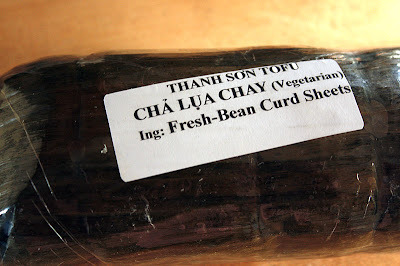 We headed to Than Son Tofu to see what we could find. When we entered the small storefront, we were faced with large stainless tubs filled with hot, just-fried tofu, as well as all sorts of familiar and unfamiliar items. In the cooler, I found a package of fresh yuba, and there were bottles of still-warm soymilk (soybean juice) in bins at the front of the store. There was a young woman behind the counter who offered us samples of the fried tofu — onion, lemongrass and plain. I'm not a big fried-food eater, and you'll never find recipes for deep fried foods on this blog, but I'm not going to lie, fried food tastes good. 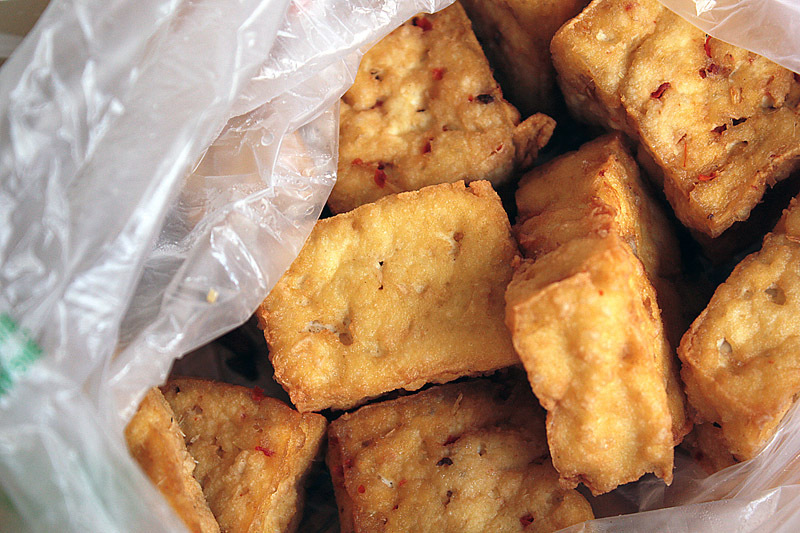 Fried tofu tastes really good. And the fried tofu we sampled was irresistible, so into a bag it went. Me: "I'd like to buy some soft tofu and some extra firm tofu." Young Woman Behind Counter: confused look. We went back and forth like this — me using words, and she using facial expressions, for a few minutes until I said, "I'd like to buy some fresh tofu." This got a big smile and the question, "how many?" "Three," I answered, and with a laugh she disappeared into the kitchen and returned with three pieces of warm tofu. 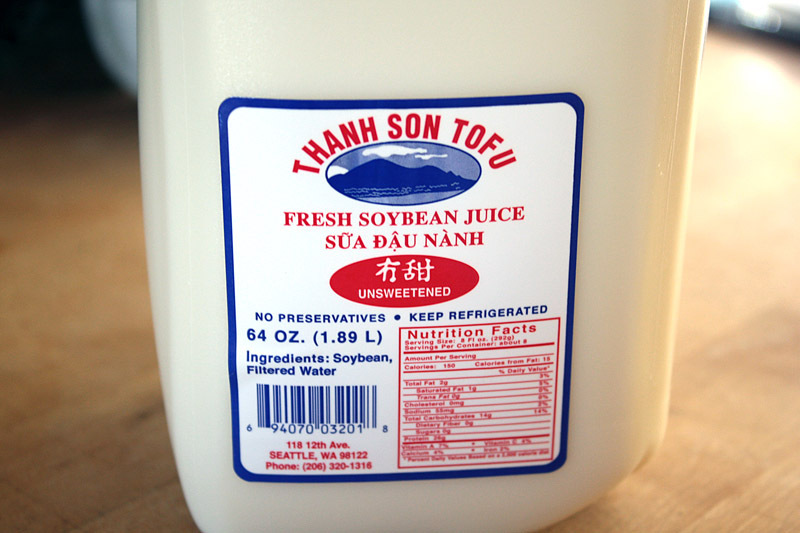 I also grabbed a jug of soymilk, or soybean juice as it was described on the label. 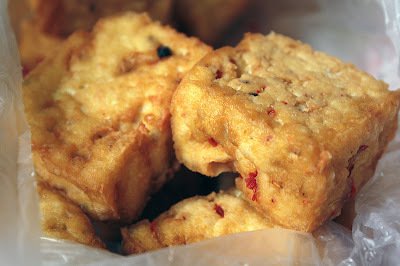 So, what did I make with the fried tofu? It seemed destined for an Asian-inspired meal, but that's not what happened. We had a big, fresh bunch of my favorite vegetable — kale — in the refrigerator, and I really wanted steamed kale with sun-dried tomatoes, kalamata olives and crushed red pepper. I just couldn't get past it, so we had the kale topped with fried tofu and green onions, with a side of brown basmati rice. Next I had to think of something to do with the fresh soymilk. I know a lot of people make their own soymilk, so this would be no big deal, but if I buy soymilk, it's in a carton and rather bland, which is the way I generally prefer it. 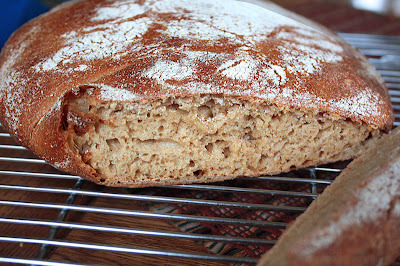 The fresh soymilk was very intensely flavored and thick — perfect for baking. 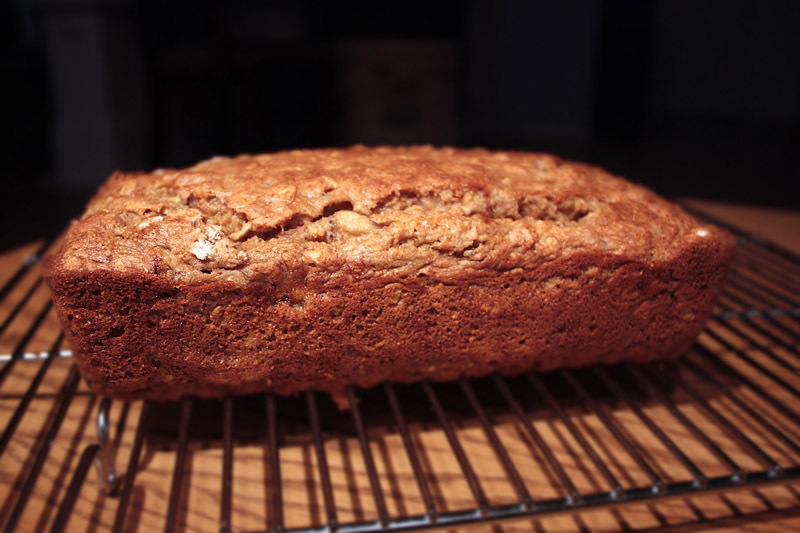 With bananas rotting on the counter, it seemed obvious that I should make banana bread, and I had intended to post a recipe for banana-oatmeal bread. Somewhere in the middle of combining ingredients, I lost track of how much flour I put in, and found myself winging it (á la River!) and unable to supply accurate measurements. This is really too bad because the bread turned out so well. I also left out some flavors I meant to include, so obviously I'll have to make another one. Which means I have to eat this one rather quickly, because I can't have two banana breads sitting in the kitchen! Banana bread wasn't the only thing baking in our kitchen. After reading about Mark Bittman's changes at the NY Times, I followed a link to one of his well-known recipes — no-knead bread. I make no-knead bread often, guided by recipes from "Healthy Bread in Five Minutes a Day," but I wanted to give Mark Bittman's recipe another try, so I watched this video, and got started. 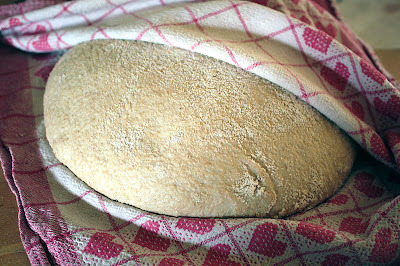 The dough had to ferment for about 18 hours, and then rise for two hours. 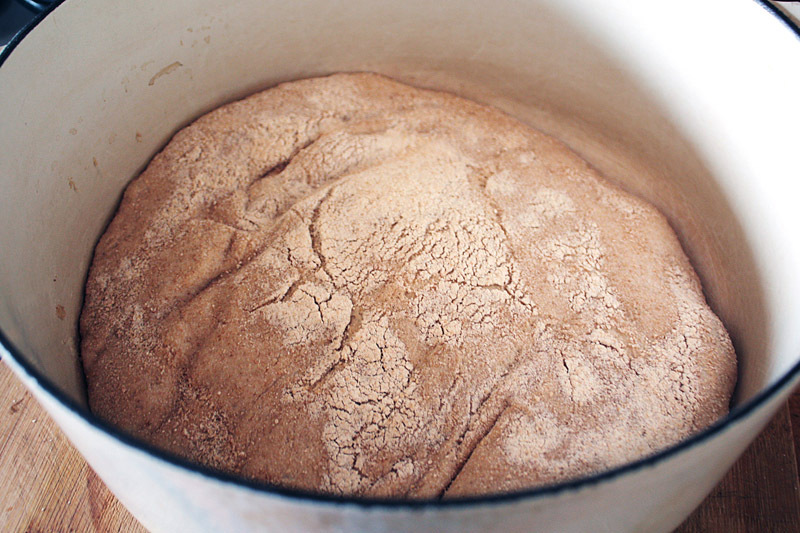 The bread got baked in a large cast iron pot; I'm sure most of you have seen this recipe — it was hugely popular several years ago. Above you can see my bread (made with white whole wheat flour) rising in its towel cocoon. I plopped it into the piping hot pot as directed, and put it into the oven. When it was done, it had a fantastic crunchy crust, beautiful crumb and gorgeous yellow color. But it was rather like a large pancake, with very little rise. It spread out into the pot instead of upward. It tasted great but I really wanted a higher rise. 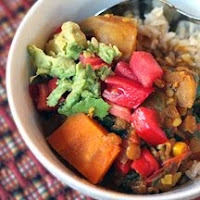 Bittman has posted a newer video with his revisions to the recipe, if you are interested. This was my breakfast today — not exactly oatmeal. There's leftover kale with sun-dried tomatoes and olives, hummus, cucumber, avocado and Bittman's bread. Crochet something and GET IT RIGHT!!! Almost a year ago, I mentioned that I was trying to revisit an old interest in crochet. My skills were never highly developed, but I thought I could at least make a hat or scarf or two, and then progress to something more complex. I made a hat and scarf and that was the end of it. But, recently, a friend asked me to take a crochet class with her, and it forces me to keep making stuff since I have to appear at the class once a week with yarn and a project . My biggest problem seems to be a streak of perfectionism that won't let me finish anything. I made this hat ... about six times! It was too big — ripped it out. It was too pointy — ripped it out. It was too small — ripped. It was ... And so on. 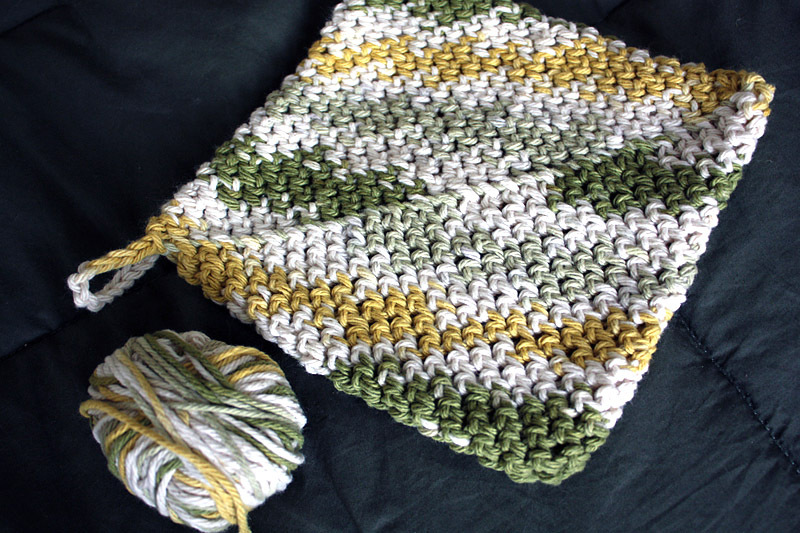 I still don't like it but I had to stop ripping before the yarn became unusable. I still intend to make another version and a scarf to match because I really like the yarn. 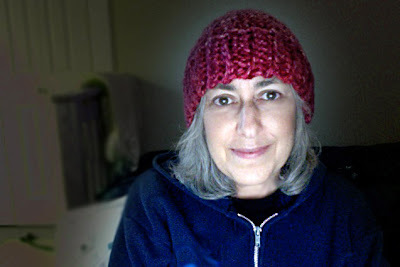 I'm making a hat for my granddaughter and I'm now on version two, but I promised myself not to make it more than twice. It looks like I'll be crocheting for a while. Will I survive? 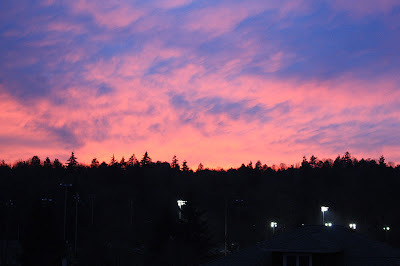 This is what I saw when I looked out my bedroom window last evening. A day to celebrate love in the world is a day to sponsor a Farm Sanctuary shelter animal! Adopt in your name or give a gift sponsorship to someone special in your life. Right now, many rescued farm animals living at our sanctuaries are in need of tender loving care. 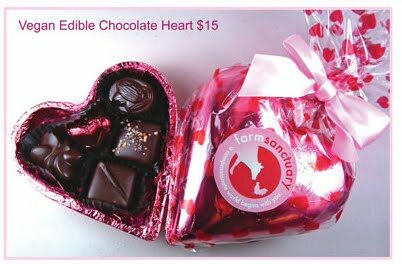 A farm animal sponsorship is a thoughtful, cute, fun, compassionate, original, and all-around wonderful way to share some love this Valentine’s Day! 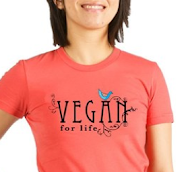 It’s the perfect way to help animals and show you care, whether it’s for your sweetheart, your mom, dad, sister, brother, a special friend, or for yourself. Sponsors receive an adoption certificate with a color photograph of their adopted friend, an adoption card, an invitation to schedule a VIP tour to meet their adopted friend, and other benefits depending on the animal chosen for adoption. See a list of sponsorship packages here. 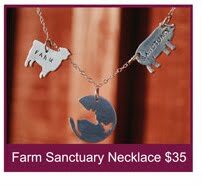 Whether your loved one has a sweet tooth, prefers a little bling, or would cherish the adoption of a special friend whose happiness he/she makes possible, Farm Sanctuary has something for everyone! And, best of all, your gift will keep giving because every purchase from Farm Sanctuary directly supports the lifesaving work they do on behalf of farm animals. 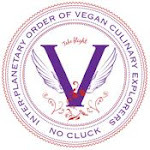 Last year I was a lucky member of the recipe testers for Celine Steen and Joni Marie Newman's cookbook, "The Complete Guide to Vegan Food Substitutions." I sometimes get questions from readers about what foods to substitute for various ingredients in recipes, and now I have the perfect reference to direct the questioners to. 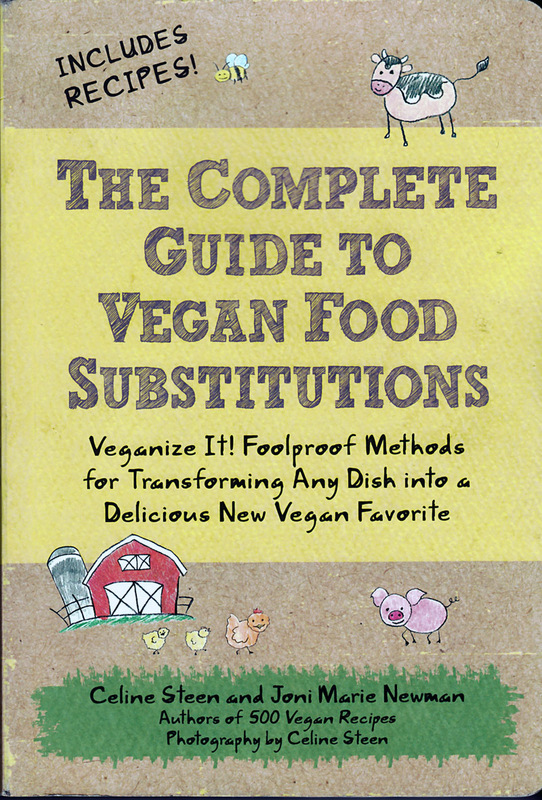 Whether you want to veganize a recipe, or avoid a particular ingredient because of health concerns or allergies, this book has everything you need to know. Dairy, eggs, beef, chicken, pork, seafood, honey, gelatin, gluten, soy, refined sugar, fat and more — Celine and Joni have got it covered. There's a full chapter for each of these ingredients with explanations of what substitutions to use, and recipes for using them. The beginning of each chapter is loaded with information about the featured ingredient, including a handy chart of substitutions, suggestions for finding substitutions at the store, recipes for making your own substitutions at home, and a sample recipe showing where and how to substitute for unwanted ingredients. 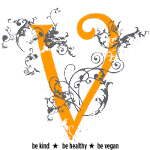 An eclectic collection of creative and delicious recipes, from fast and easy to more challenging, follows. Below are some of the recipes I tested for the book. The fast and easy walnut "parmesan" sprinkles (above) appears in the cheese chapter, as do other tempting recipes like Indian-spiced pumpkin gratin and savory artichoke pie. One of our favorite (maybe our favorite) recipes from the book is "beef" and broccoli bowl, (above) a very easy and extremely delicious seitan dish that appears in the meat chapter. This is often our go-to recipe when we can't think of what to make for dinner. First we make one of the incredibly fast and easy seitan recipes, and while it cooks, we put rice into the rice cooker, and throw together the sauce. There's a recipe for seitan cutlets that only takes a few minutes to mix, and about 20 minutes to bake. If we have more time we might make baby back ribz (below). 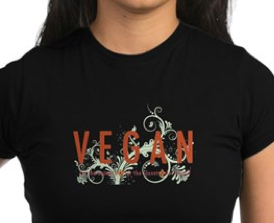 If we don't feel like making seitan, we use tofu, or mushrooms, or cashews, or whatever we have. Sometimes we put it into nice bowls and serve it to company. It's both delicious and impressive. In the sugar substitutes chapter you'll find salted caramel wheat treats. I made these for a vegan bake-sale which is why they're all wrapped up and tied with ribbons. Truthfully, wrapping them quickly was the only way I could stop myself from eating them all on the spot. 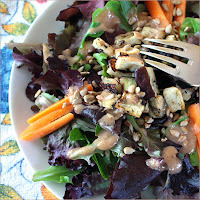 Kablooey (above) is a simple, wonderful kasha (toasted buckwheat) salad that appears in the fat substitutes chapter. These are the best oven fries. The best. We love them. They're called smoky potato wedges, and you don't think you need another recipe for oven fries, do you? Well, you're wrong. These are great! The recipe can be found in the meat substitutes chapter. This is a good place to say a few more words about how the book is organized and indexed. Trying to find a specific recipe can be challenging if you don't know where to look. I searched the index under "p" for potato, and "s" for smoky, to no avail. I finally flipped pages until I spotted a photo of the potatoes in the meat chapter. I checked the index under "meat," but the recipe isn't listed; I finally found it under "side dishes." So, if you're just looking for a recipe to try, you're sure to find something interesting, but if you're looking for a specific recipe, it's a little trickier until you become familiar with the book's organization and limited index. Denver quiche is, of course, in the egg substitutes chapter, and listed in the index under "main dishes." 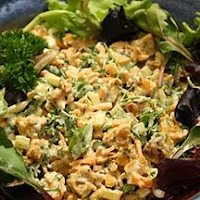 You can find super simple creamy dijon dressing in the animal by-products substitutes chapter (subbing for honey-mustard dressing) and in the index under "salads." BBQ beans is in the by-products substitutions chapter because it avoids honey. You can find it listed in the index under "soups and stews" because I'm telling you it's there. Otherwise, good luck. 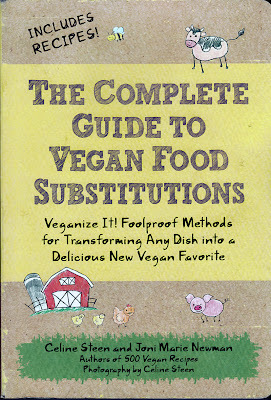 While it's true "The Complete Book of Vegan Substitutions" does offer you extensive information on how to veganize just about anything, it would be a mistake to think of it just in those terms. 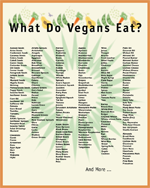 It's a cookbook filled with tempting and delicious vegan recipes, as well as a resource for those wishing to avoid animal products. Full disclosure: I received this book in exchange for testing recipes. Doing a review was my idea, and I received no pay for writing it. Just a note to say I've been very involved in a graphic design project over the past few weeks, and worked on my computer a bit too intensely, and without paying enough attention to ergonomics. I really wrecked my shoulders, neck and back, and have been staying away from the computer as much as possible. I haven't been leaving comments but I've tried to keep up as best I can with reading on my husband's ipad. I'm feeling much better but not 100% so am still being careful. I thought this was a wonderfully inspirational video that you might want to watch. 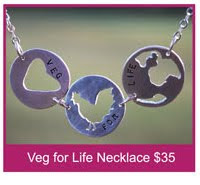 Many people embrace a vegan diet for health reasons, and Kris Carr explains her lifestyle choices with grace and beauty. Recently, I was shopping for light miso — brown rice or mellow barley — in a large Asian market. I usually buy miso at a natural foods store where there aren't that many choices, and all of them are basically soybeans and salt, or something like that. At the Asian market there were dozens of choices, and I was label reading like crazy. I was kind of surprised to find fish listed as an ingredient in so many brands. It took quite a while to find one that was fish-free. I guess I didn't realize that miso was likely to contain fish. Did you? This is cecina, which also may be called farinata or socca. It's an Italian flatbread made with chickpea flour, stock and herbs and is so delicious. I found many recipes on the Internet but none were quite like the one I tested, and because it's a test recipe, of course I can't publish it. Look for a recipe that uses about equal amounts of flour to liquid, and be judicious with the olive oil and salt! Here I am, the dessert queen (just joking, here), back to review another dessert book. (The last review was for "More Great Good Dairy-free Desserts," by Fran Costigan.) 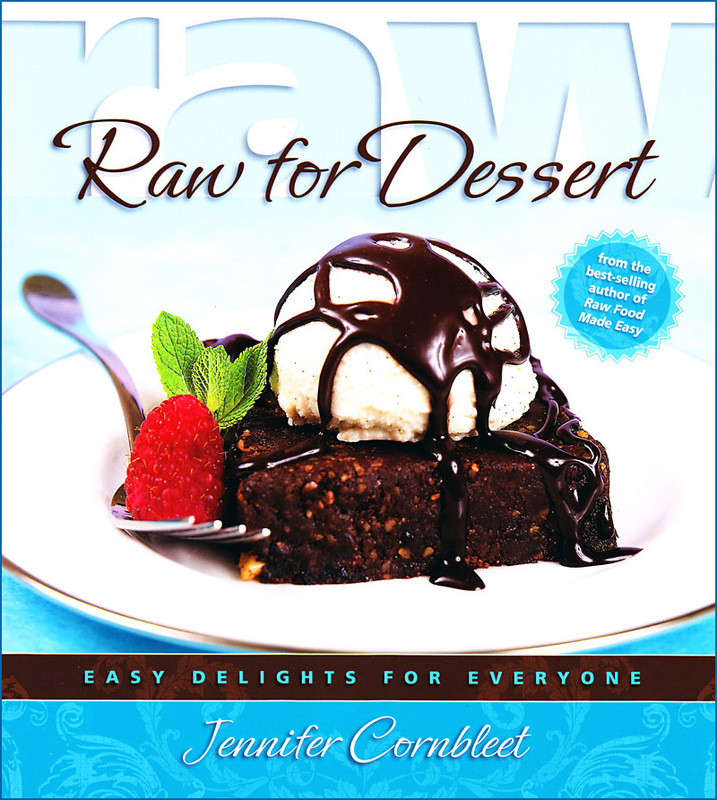 This review is for "Raw for Dessert," by Jennifer Cornbleet. I reviewed another of Jennifer Cornbleet's cookbooks, "Raw Food Made Easy," and found cooking from her recipes a deliciously pleasant experience, so I was looking forward to trying this book, too. First let me clarify that I'm not a raw foodist. 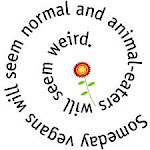 I eat a lot of raw food, (more in summer, less in winter) but it's usually in, or close to, its natural state. Soaking, sprouting and drying just don't happen much in our kitchen. 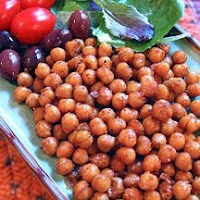 For example, last night we had small bowls of cooked lentil soup, and huge mixed green salads piled with shredded carrots. For dessert we each had a satsuma, and I also had a date. I may occasionally make dried fruit and nut balls, a raw cashew cheese or other specialty item, but it's not a frequent occurrence. Our desserts are usually raw — but not creative. 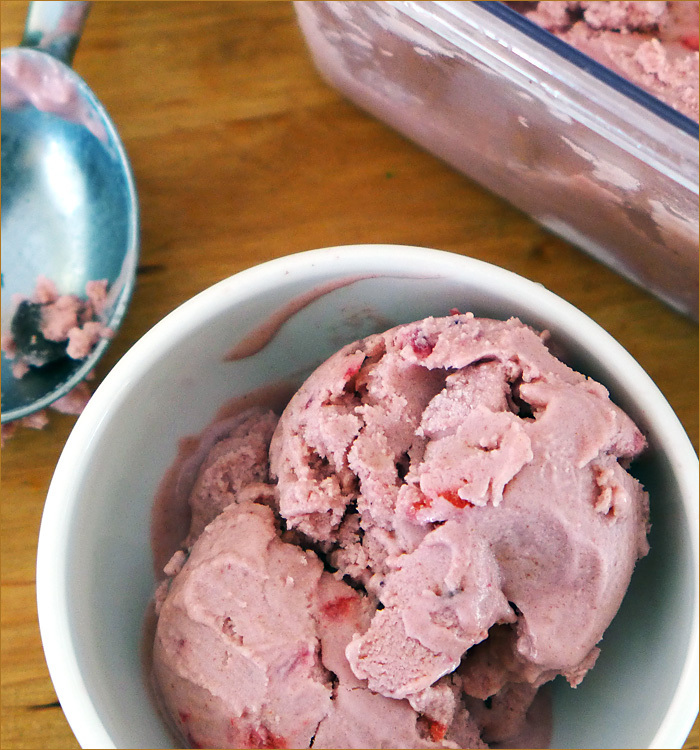 In the warmer weather we might have fruit salad or raw ice cream made in the Vitamix, but more often than not, it's plan old fruit. For company, dessert is usually baked. You get the picture. I tend to balk at complicated food prep procedures, or those requiring days of planning and soaking, unless it's for a very special occasion. This probably applies doubly to desserts. And I'm going to admit this, though I don't want to offend anyone, raw desserts scare me a little. I've had gorgeous-looking raw desserts that tasted like bites of solidified coconut oil, and which I couldn't eat. So many fancy raw desserts are so dense with fat, I don't enjoy them, and they upset my stomach. But still, I was up for discovering something new and wonderful about making raw desserts, so I approached the "Raw for Dessert" book with an open mind. And I think I found a raw dessert book to enjoy. The book starts out with a chapter on stocking the pantry. If you are a serious raw dessert maker, the pantry list is an excellent guide to what to keep on hand to make any dessert in the book, with the addition of only fresh fruit and mint. If you are a casual raw dessert maker like me, the list might seem overwhelming and expensive, but useful as an overview to what goes into raw desserts. There is also a helpful equipment list, and suggestions for serving ware. 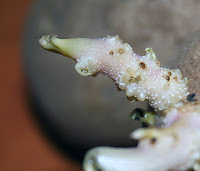 The chapter continues with basic techniques for soaking nuts and opening young coconuts, and proceeds with explanations of cutting terms, and directions for cutting fruits. I personally found the directions for cutting a fresh pineapple very helpful. The first cooking chapter covers all the basic creams, sauces, toppings, frostings, and crusts that combine with other ingredients and recipes to create the desserts. Things like date paste, pastry cream, lemon curd, caramel sauce and praline are found here. It was in this chapter that I found the shortbread crust that went into the pineapple upside-down cake, and within this collection, you might find the perfect topping or filling for a dessert you are planning. The next chapter is filled with luscious-sounding fruit desserts, from simple assemblies like strawberries in orange juice to more complex creations like caramel apple stacks and mango-raspberry crumble. Next, in the sorbets, ice creams and sundaes chapter, you'll find everything from a no-fat-added bitter chocolate sorbet to knockout brownie sundae, or cookies 'n' cream ice cream. The cookies, cakes and bars chapter has temptations like chocolate lava cake, lemon-cranberry pistachio cookies, and one-bowl brownies, and the pies and tarts chapter gives you treats like key lime pie, cherry custard tart with sliced almonds, coconut cream pie and chocolate truffle tart. There's even an intriguing recipe for pumpkin pie that's made with carrots. The last two chapters cover creamy desserts and candy, with recipes like milk chocolate pudding, dark chocolate truffles and pine nut caramels. The desserts are relatively easy to make and sound so delicious. 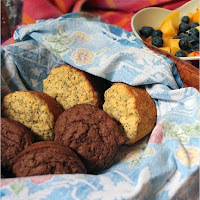 The recipes depend mainly on nuts, dates, fresh and dried coconut, and fruit. There are so many tempting choices I had trouble deciding what to pick, but I was fixated on the shortbread crust, so I chose a recipe that used it — pineapple upside-down cake. The first challenge was finding the correct size six-inch round baking pan. None of the stores I looked in had one, so I went to a specialty kitchen store downtown where I found a seven-inch pan. (The six inch ones were out of stock and wouldn't be in until the end of January.) I'm thinking of getting the six-inch, too, because I think the cake might have turned out better with the right pan. I made the cake for a family dinner, and everyone seemed to enjoy it — some even had seconds — but I found the shortbread part a little too wet and mushy. Maybe it was spread too thin in the too-large pan. I decorated my cake with dried cranberries, though that's not part of the recipe. You can find this recipe plus other sample recipes, here. It's a variation of jumble berry upside-down cake, substituting 2-1/2 cups of thinly sliced pineapple for the other fruit, as directed in the book. For the pineapple, I purchased a half pineapple, and it was exactly the right amount. Place the pineapple and agave syrup in a medium mixing bowl and toss to combine. Let sit for five minutes. Line a six-inch cake pan with a parchment-paper round. Place half of the pineapple on the paper. Top with half of the Shortbread Crust, distributing it evenly. Press down with your hand to compact. Repeat with the remaining pineapple, and then cover with the remaining crust. Chill in the refrigerator for at least 30 minutes or up to 12 hours before serving. Covered with plastic wrap and stored in the refrigerator, Pineapple Upside-Down Cake will keep for two days. Place the coconut, walnuts, and salt in a food processor fitted with the S blade. Process until finely ground. Add the dates and process until the mixture begins to stick together. Don’t over process. Stored in a sealed container, Shortbread Crust will keep for one month in the refrigerator or for three months in the freezer. The crust doesn’t need to be thawed before using. Disclaimer: The cookbook was sent to me without cost, and I was not compensated for the review. On Saturday we met Spotted Devil Cat's Vegan Assistant blogger, Bethany and her husband at Highline vegan bar for brunch. (Here's a good review of Highline, if you're interested.) This was our second time at Highline, and our first time for brunch. Bethany insists that brunch is far superior to other Highline offerings, but I disagree. On our first visit, four of us went for lunch, and had sandwiches and sides. All the sandwiches were huge and delish — especially mine — though I think the other three would say the same. I had a "fish" sandwich, the "fish" of which seemed to be made of layers of yuba, wrapped with nori, and fried. It had excellent coleslaw on it, and if it had come without the extra coating of mayo and the heavily buttered bread, it would have been perfect. (Is it possible to grill bread without all the grease?) Brunch is an entirely different menu. Anyway, I had just experienced a couple of days of big eating, and was looking for something on the lighter side. I know, I know, wrong place to do that. But, I found a coconut milk yogurt parfait with granola and fresh fruit listed on the menu, and that sounded really good to me. It tasted just like the coconut milk yogurt I get at the co-op, and was about the same quantity as in the little cups. It was topped with about a tablespoon of a not-so-creative granola, and surrounded by some, but not a lot of, fresh fruit. It cost $9, and while the sandwiches are a bargain, this seemed a little over-priced. And maybe some seasonal fruit would be nice. My husband had scrambled tofu and greens, though the menu description led him to believe there would be more greens and less tofu. 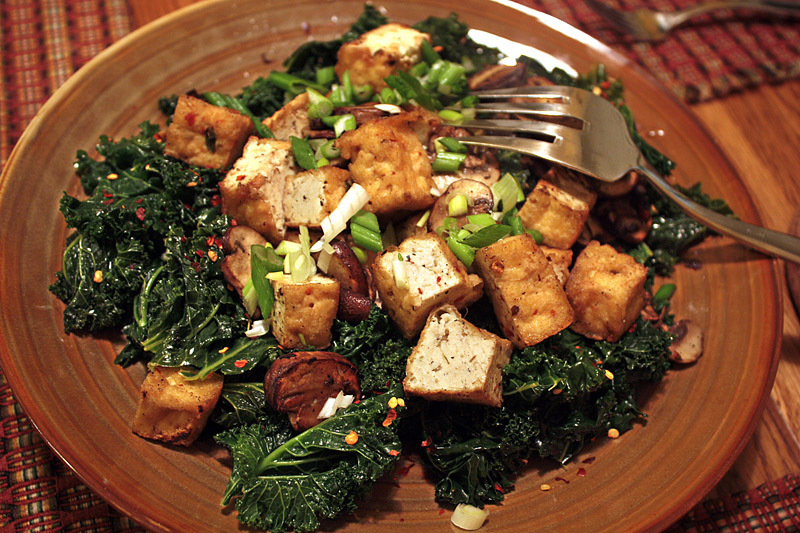 He left a lot of it so I ate some of the greens and I thought they were tasty, but I didn't like the tofu at all. He agreed with me that the sandwiches we'd had were so much more exciting. Bethany had an omelet with a side of hash browns, and now that I think of it, I don't know if she liked it or not, since we weren't talking about the food, but of other things. Her husband had something covered with gravy, and I (cough, cough) decided not to photograph it. Trust me, you wouldn't want to see it. He seemed to like it, though. The real reason we were in Capital Hill on Saturday, was to go to a book signing with Melisser Elliot, who recently wrote the excellent "The Vegan Girls Guide to Life," which I reviewed, here. 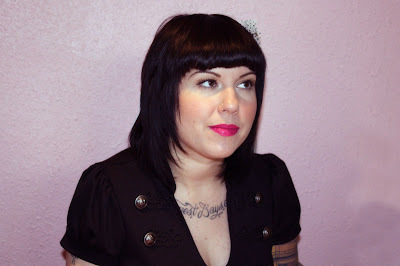 You probably all know Melisser from her blog the Urban Housewife, and she is just as sweet and delightful as you might expect from reading her blog, and seeing her smiling face. Melisser has a life-size tattoo of her two-pound dog, Strummer, on her arm! Melisser's signing was at Cakespy, a charming shop owned by Jessie Oleson, cake spy, artist and writer. We had walked from the restaurant to Cakespy, because parking in Capital Hill is hard to come by, we already had parking spots, and exercise is always a good thing. On the walk back to the car, we saw a dog observing the scene in Capital Hill from an open window. We also passed a work of urban art on a fence — this image is made entirely of bottle caps. Dessert. I have kind of an awkward relationship with dessert. On the one hand, I love the idea of dessert — it's so appealing to share a rich and beautiful sweet with guests at the end of a meal — but on the other hand, I've never liked extremely sweet or rich foods. I'm fascinated by the voluptuous appeal of a beautiful dessert, but ultimately disappointed by the often too sweet/too rich taste. I know. I know. I'm the odd one out. I've been known to stare into a bakery window, gawking at the riches within, then walk away, sated by the view. There have been times when I've upped the sweetener in a dessert to what seems to me drastic proportions, to please guests, and then heard comments like, "I really love this — it's not too sweet." Sometimes it seems like my version of "not too sweet" and others' version are from different universes. 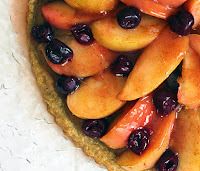 In spite of this, I never get tired of fantasizing about desserts and making them in real life, and there are more than 50 recipes on this blog to confirm that. It was with both excitement and worry (mostly excitement) that I agreed to accept two dessert books from The Book Publishing Company, with a plan to review them. Would I want to make any of the recipes? Would I feel compelled to alter them? 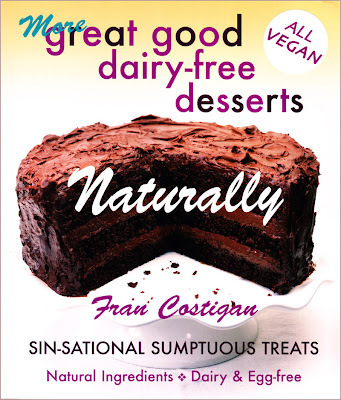 I decided to try one dessert from each book, and the first book I perused was, "More Great Good Dairy-Free Desserts," by Fran Costigan. The book contains a great first chapter on everything you need to know about ingredients and equipment, as well as tips and techniques for baking success. She answers all the questions about agar agar, and the difference between cornstarch and arrowroot. 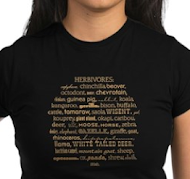 She covers sweeteners and fats, and lots of other sweet and sticky subjects. The information was thorough and helpful. The rest of the chapters were filled with so many inviting recipes like mango pineapple mousse, chocolate cranberry bread pudding, better baklava, blueberry slump, good cornbread, dark moist spice cake, tart lemon spread, currant scones, amazing hot fudge sundae cake, lovely light lemon cake, fruit and cream tarts, frozen desserts, fruit desserts, and a New York egg-less cream. It was hard to choose. It would have been nearly impossible to pick a recipe if I hadn't been itching to make a bundt cake, and found a recipe for big orange bundt cake. I made it for a family dinner, and it got eaten right up, with much approval from the diners, including me. In addition to great taste, it had a wonderful texture and rise. I did make a couple of very minor changes, and a more substantial one, but the results were still excellent. Instead of using 2/3 cup of oil, I used 1/3 cup of oil and the rest soy yogurt. You can find this recipe and others on Fran Costigan's Web page. I expect I'll be making many more recipes from this wonderful book. 1. Position a rack in the middle of the oven and preheat to 350 degrees. Oil* a 10- to 12-cup Bundt pan thoroughly. 2. Place a wire mesh strainer over a medium bowl. Add the pastry flour, white flour, baking soda, salt, baking powder, sugar, and dark whole cane sugar to the strainer. Tap the strainer against the palm of your hand to sift the ingredients into the bowl. Stir with a wire whisk to distribute the ingredients. 3. Combine the oil, orange juice, soymilk, vinegar, vanilla and orange extracts, and zest in a separate bowl, and whisk until well combined. Pour into the dry mixture and stir with a whisk until the batter is smooth. 4. Pour the batter evenly into the prepared Bundt pan. The pan will be two-thirds full. (If you have more batter than that, perhaps a cup or so, bake it in one or two 1-cup baking ramekins or custard cups.) Smooth the top of the batter with a small spatula. Rotate the Bundt pan to level the batter, and tap it lightly on the counter to eliminate air bubbles. 5. Bake for 45 to 55 minutes, until the cake is golden and springs back near firm at the center when touched lightly. A tester inserted in a few spots near the center of the cake should come out clean or with only a few moist crumbs. I made my own glaze for the cake. Whisk 1/2 cup of orange juice into two teaspoons of arrowroot in a small pot. Add 1 to 2 teaspoons of evaporated cane juice, and cook and stir until the glaze thickens and clarifies. 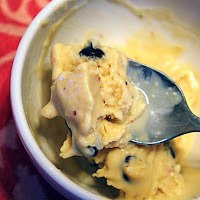 Remove from heat and stir in 1/2 teaspoon of orange extract OR vanilla extract, and one teaspoon of soy yogurt. Drizzle over the cooled cake. * I follow the directions for greasing a bundt pan that I found on a baking forum. Use equal parts of Earth Balance (or vegan shortening), oil, and flour. ( About 1 teaspoon each is plenty.) Mix the three together and grease the pan. I've never had a bundt cake stick using this method. Disclaimer: I received the book for free. I reviewed the book for free. All opinions are my own. I made Texas caviar, as usual, but with a couple of variations. I added two large grated carrots, and about a cup of chopped parsley instead of cilantro. 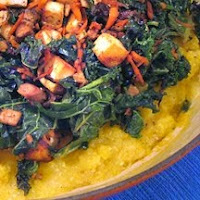 We also had baked polenta with smoky tomato sauce and capers, mixed roasted vegetables, steamed kale with garlic, and a big green salad. Our plates of food were so colorful and delicious. For dessert we had a raw pineapple upside down cake from Jennifer Cornbleet's "Raw for Dessert" cookbook, which will be in my next post. I hope everyone is moving into the New Year with health, happiness and energy.